This month we profile Blackbee Investments & spoke to John Whiriskey (Business Development Manager with BlackBee), to explain their investing strategy. BlackBee Investments is an investment firm based in Cork. BlackBee Investments Limited is regulated by the Central Bank of Ireland. At Blackbee our investment approach is based on methodology, research and investment skills. We explain complexity and make the right decisions at the right time. BlackBee’s obligation to clients is not to make forecasts, instead it is to explain economic events, place them in context and build investment ideas around the likely winners. We are the trusted partner of financial advisors, institutions, charities and private clients. BlackBee Investments have launched over 250 products in the last 3 years with over €300m in assets invested on behalf of our 3000+ clients. Structured products are innovative and flexible investment instruments that represent an attractive alternative to direct investment (such as shares, bonds, currencies etc). Thanks to their flexibility, they lend themselves to investment solutions to suit any risk profile, even in the most challenging market situations. Risk is always present when investing, but particularly so with direct investment. Direct investment into funds or equities brings a risk of market timing and potential capital loss. The only certainty with markets is that they will most likely be volatile. Taking a structured approach can reduce the risk of market timing, volatility and capital loss. A structured approach allows investors to target a fixed level of return from an asset class, stocks or an index, whilst protecting capital. In addition, the use of our innovative Twin-Win feature allows for profit to be realised even in falling markets. In this uncertain environment a structured approach provides for known outcomes and can reduce risk. Direct investment relies on markets rising while structured outcomes can create positive outcomes in flat or falling markets. As with all investments, it is important to have your attitude to risk assessed to ensure that your investment is in line with your Risk Profile. Should you wish to have your attitude to risk assessed, please complete our Risk Assessment Questionnaire. 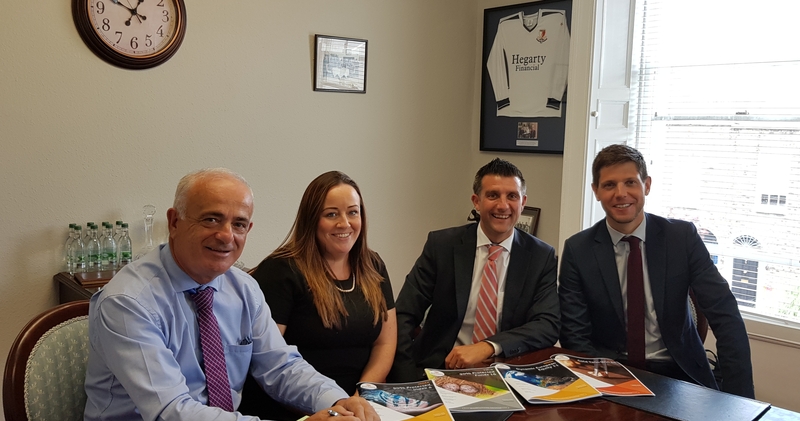 From Left to Right; Jim Hegarty, Trish Jukes, Ross Craigie with John Whiriskey, Business Development Manager with BlackBee Investments.